DETROIT, Mich., March 14. — The vanguard of the rank and file of the Briggs strikers are lining up in the Metal and Machinery Workers Industrial Union of the I.W.W. The I.W.W. came into the field at the end of last week in response to a call for a bona fide industrial union from these leading spirits among the rank and file. A strike headquarters for the Metal and Machinery Workers Industrial Union 440 has been opened up at 121 Victor in the strike zone just a block from the main gates of the H.P. Plant. Here men and women who are active in the strike are coming every day and signing up for red cards. Several mass meetings were held last week at the Woodmen of the World's Hall near the strike headquarters. Speakers from among the strikers are being developed at these rallies. F.R. Cedervall, I.W.W. organizer who has addressed many meetings throughout the City of Detroit in behalf of the strikers, is a regular-speaker at these mass meetings. His remarks from the platform are very well received by the strikers. The mass meetings have been well attended and the new members are catching on to Wobbly songs very quickly. The Highland Park Plant was shut down Monday, March 13. Strikers are making visits to the home of these ignorant workers who are now laid off with the purpose of teaching them the lesson of labor solidarity so that they will join in with their fellow workers in the I.W.W. instead of returning to the H.P. slave house should Briggs call them back to work. Several educational meetings have been held by the new members. Members of the I.W.W., schooled in the principles of industrial unionism, are carrying on a vigorous man-to-man educational campaign among the ranks of the strikers. New members are eagerly reading the new I.W.W. pamphlets, "One Big Union" and "The General Strike" and selling them to their fellow strikers. Bert Blancett, the metal finisher from Mack who was kicked in the groin so badly by H.P. Cop No. 7 in the fracas at the North End plant February 28 that rupture of the bladder was feared, has been discharged from the Receiving Hospital. "I'm on my feet now," says Fellow Worker Blancett, "though I feel weak, I'm more determined than ever to carry on my part in the strike." Since Blancett is no longer able to march on the picket line dike to his injury, he is working on legal defense with Paul Gonzer and Ben Linsky of the General Defense Committee, to see that no strikers are rushed through on framed-up charges. A striker found a rusty gun in his cellar two weeks ago. Being broke, he took it down to a pawn shop to see if he could borrow a dollar on it. The pawn broker took one look at it and told him it wasn't worth a cent. Five minutes later, as the striker was walking down the street he was picked up by a police cruiser. After being held incommunicado for nine days, he was released with a warrant to appear in court March 15 on a concealed weapon charge. "After considering things carefully for the past five days and with full knowledge of what I am doing, I hereby consider that the only way to keep unity and solidarity in the rank and file is to tender my resignation. This act on my part is for the good of the strike, as I feel that I am not needed on the picket lines any more." With compliments to the Strike Committee for their efforts in trying to bring the strike to a speedy close and to the men who worked with him on the picket line, Darrow tendered his resignation as General Picket Captain "with deepest regrets". Darrow is still serving on the Strike Committee and is now devoting most of his energies to relief work. Briggs is gradually laying off men at Mack Plant. Employees who are being let out find notices in their final pay envelopes signed by Henry Hund, General Manager, which explain that Briggs cannot continue to manufacture bodies when nobody is buying cars. General Manager Hund thanks his scabs for their cooperation. Strike-breakers cannot produce bodies for Ford and Chrysler, it seems. Ford's giant plant at River Rouge shut down tight as a lid Friday, March 19. Henry Ford, as Briggs' chief customer is able dictate low contract terms for bodies. He is in this way indirectly responsible for starvation wages Briggs employers recieve. Henry Ford is getting the boomerang now. The men and women still out on strike at Mack Plant are carrying on as usual with determination. Since Mayor Murphy decreed picketing legal, picket lines are marching at both gates. A new and spacious hall a few blocks from the plant has been secured for office headquarters and regular mass meeting place. "R-r-revolutionary" politicians from the Proletarian Party are delivering pep talks this week to 4,000 fighting men and women who are carrying on the strike. Attorneys affiliated with the Socialist Party in Detroit have drawn up plans for an "independent industrial union"/ According to these plans, a president and ten vice-presidents along with a board of control will lead the Briggs strikers and workers of the auto industry to salvation. The Personnel Department of Briggs Mfg. Co. is being revised, according to reports originating from executives at the Mack Plant. Two experts from New York are replacing the present Personnel Director and Employment Manager for reorganization purposes. According to the text-book definition, personnel administration "plans, coordinates, and directs all human relations within a plant to the end that production may go on at a minimum of friction and with due regard for the genuine well-being of all members of the organization". Apparently members of this new personnel department all wear blue uniforms and nickel-plated shields. Through the windows of the Employment Building at the Mack gate where the Personnel Department is housed, they can be seen toying with their scientific instruments (black-jacks and revolvers) for "directing human relations". Ex-Judge Connoly, Briggs Treasurer, seems to be filling the rule of Personnel Director—laying plans for more efficient hiring and placing of scabs and more arrests and convictions of strikers "coordinating" the McClellan precinct police force with the Briggs employment office "to the end that production may go on with a minimum of friction". Connoly is shaking up Murphy's cops—"with due regard to the genuine well being"—of the Briggs organization. To date Director Connoly has succeeded in getting precinct officers who were slow at fixing charges on strikers replaced by uniformed yes-men who are imbued with "the spirit of co-operation." A benefit dance for the Highland Park strikers will be held at the I.W.W. Union Hall, 3747 Woodward Ave. Saturday evening, March 13. Jacob Margolis, brilliant orator and authority on the labor movement, is coming from Pittsburgh to deliver an address at the I.W.W. Union Hall, Thursday evening, March 16. His subject will be of a general nature—"Must we Wait and Starve?" Ralph Chaplin and F.R. Cedervall will explain the "I.W.W. 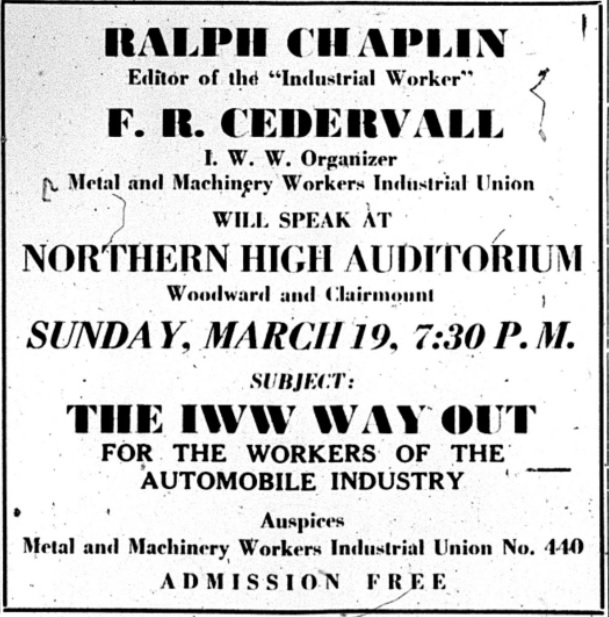 Way Out" to strikers and other workers at Northern High Auditorium, Sunday evening, March 19.